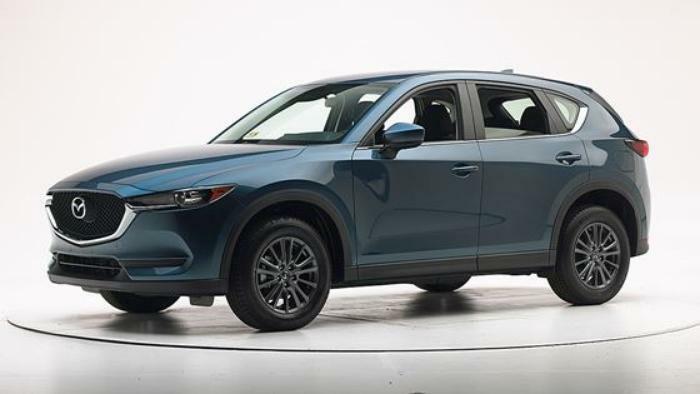 The redesigned Mazda CX-5 is the latest vehicle to win the Insurance Institute for Highway Safety's (IIHS) highest safety award -- TOP SAFETY PICK+. The 2017 model, like its 2016 predecessor, has good ratings in all five of the Institute's crashworthiness tests: small overlap front, moderate overlap front, side, roof strength and head restraints. The small SUV's standard front crash prevention earned an advanced rating, while an optional, higher-speed system was rated superior. Both avoided a collision in the 12 mph IIHS track test, and the optional system avoided a collision at 25 mph. The CX-5's Grand Touring and Sport trim lines have headlights that earned an acceptable rating. The former trim includes high beam assist, a feature that automatically switches between high beams and low beams, depending on the presence of other vehicles. To qualify for the 2017 TOP SAFETY PICK award, a vehicle must have good crashworthiness ratings across the board and an available front crash prevention rating that earns an advanced or superior rating. The "plus" is awarded to vehicles that also have good or acceptable headlights.